When our rescue dog Sunny came from Iowa to Columbus, Ohio to live with us, he stayed pretty close to home. 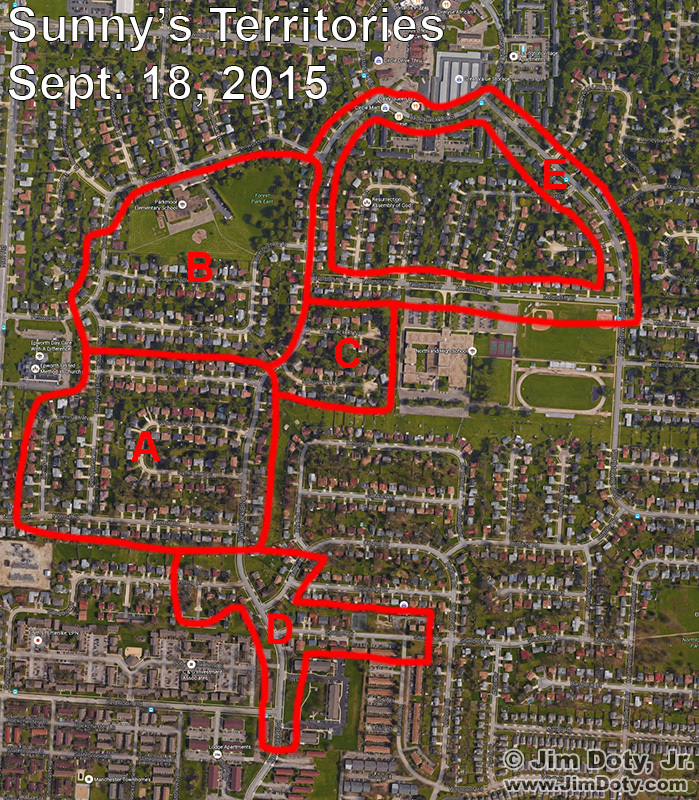 FYI: Each red territory means Sunny has walked the length of every street that is within the marked territory. For example, on the September 18, 2015 map, you can see Sunny walked the streets that wrap around the outer edge of what is the beginnings of Territory E. By July 19, 2017 he has walked every street in the expanded Territory E, filling it in. Over time you can see Territory F expand in three stages. In the last map you can see Sunny has walked most but not all of the street that is the northern edge of Territory F.
When we got Sunny in December 2008, the vet estimated he was four to six years old. Sunny had a rough life before he became our beloved pet, so he had fear issues. When we went for our daily walks (and sometimes 2 or 3 times per day), I let him choose the route, walk wherever he wanted, walk as long as he wanted, and go home when he wanted. At first Sunny stayed very close to our home, and wanted to stay on our horseshoe shaped street. Eventually he got a little braver and less fearful and ventured out to the streets right around our street (Territory A). He was content for a long time in Territory A, and then one day he headed north up the street that borders the east side of Territory A and wandered into Territory B. He discovered the park in the northeast corner of Territory B. The park became one of his favorite destinations and for the rest of our time in Ohio, about 50% our walks went by, into, or cut through the park. Some days we would play in the park. Sunny was content wandering Territories A and B for several years and then for the first time he crossed the major street that borders the east side of Territories A and B and entered Territory C. I had mentally kept track of his territories from 2008 to 2012. 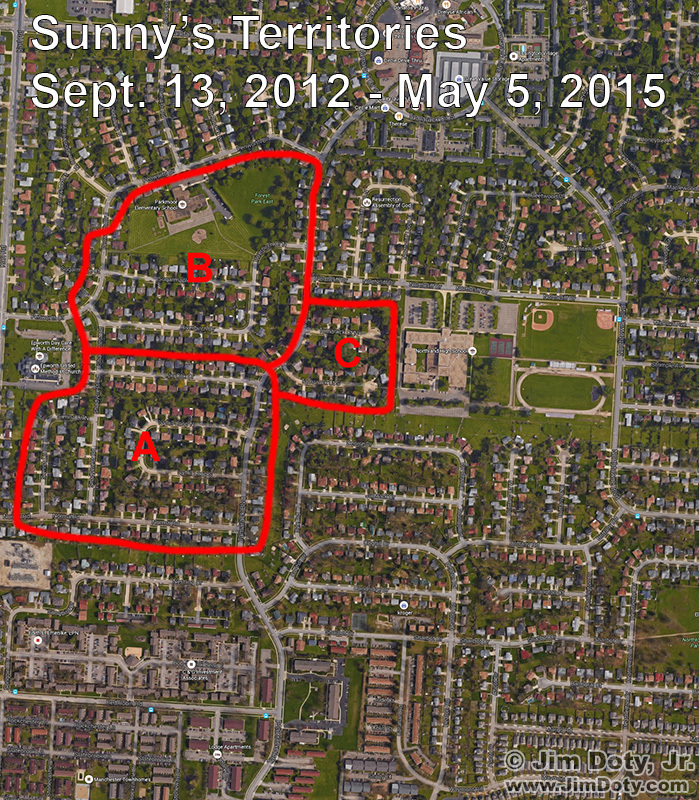 In the fall of 2012 I started keeping track of our walks using Map my Run. It was his entry into Territory C that inspired me to keep a better record of our wanderings. Sunny’s Territories, September 18, 2015. In the spring of 2015, almost 6 1/2 years after we got Sunny, he began a surprising and unexpected territorial explosion. For the first time he crossed the major street on the south side of Territory A and headed into Territory D. By the fall of 2015 he had expanded Territory D and added the beginnings of Territory E by walking a long loop on the streets to the northeast of his established territories B and C. Even though he had never been there before, he was so far from home on streets he had never been on before, I thought I would need to guide him home. I didn’t. Somehow knew how to find his way home without my help. Sunny’s Territories, May 26, 2016. The territorial expansion began again in the spring of 2016. By late May Sunny had added the beginnings of Territory F and all of Territory G.
Sunny started his territorial expansion much earlier in 2017, starting in the winter instead of waiting until spring. 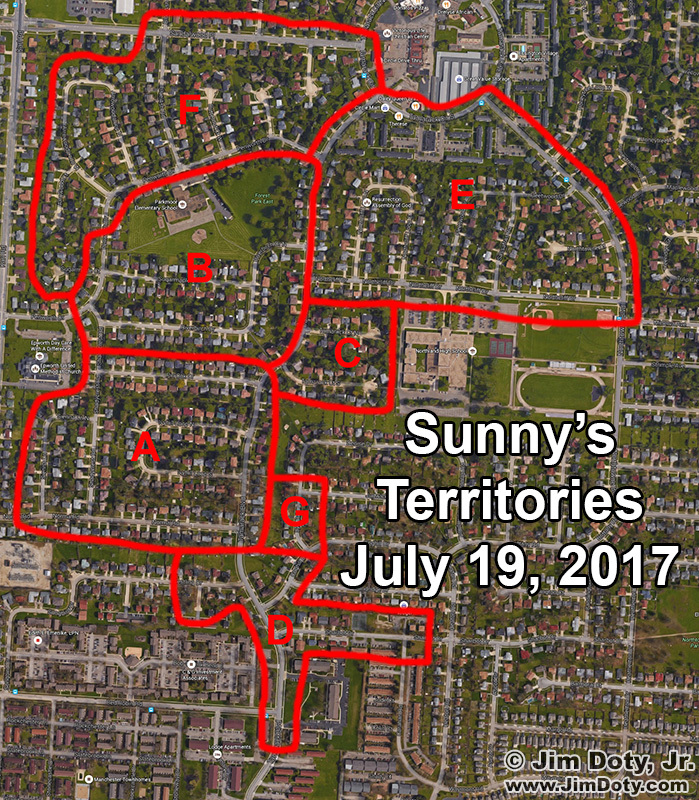 By early February he had added more streets to Territory F.
Sunny’s Territories, July 19, 2017 (and on into 2018). 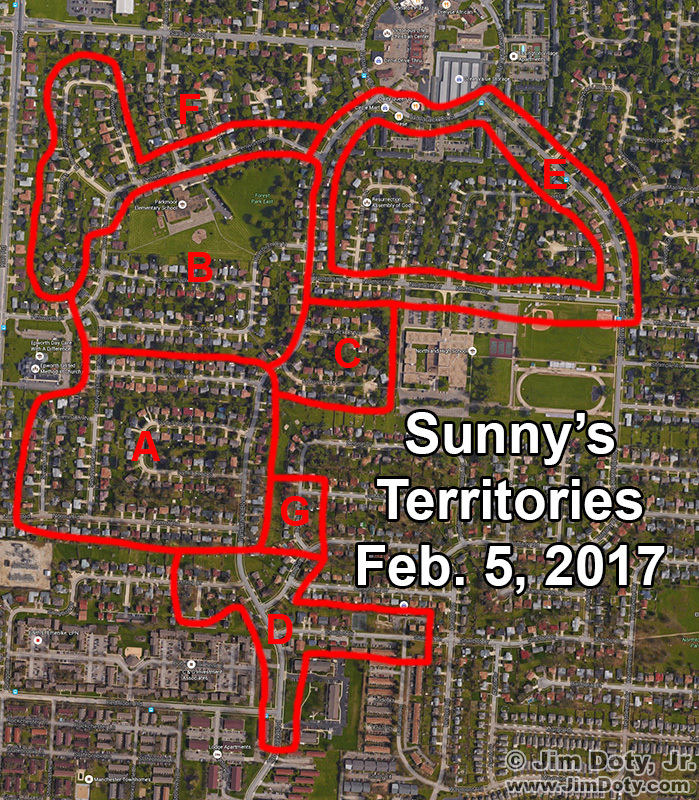 By mid summer 2017, Sunny had added another major addition to Territory F and added several streets to Territory E. That was the end of his territorial expansion for 2017. For the rest of the year he wandered his far flung territories. In late 2017 Sunny had a terrible health crisis that nearly ended his life. It took a long time for him to recover. He stayed in Territories A and B in 2018 up until the time we moved to Iowa at the end of summer.